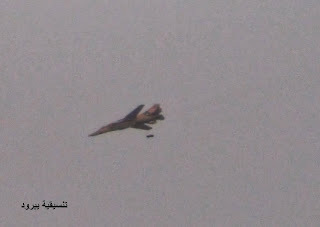 I awaited this day, the end of 2013 to share my UPDATED LIST of aircraft and air vehicles spotted over Syria since the beginning of the uprising on 15th March 2011. As usual, I would like to remind readers, observers and analysts here, that this list does not reflect the actual air raids and bombardment sorties SyAAF -or let us say Assadist Air Force to be accurate- is conducting in Syria as the actual rate is much more higher. Hundreds of videos are available as well for post-bombarding showing the after-impacts of a bomb been released over somewhere without showing the aircraft itself. - Spotting for the first time a V.I.P transporter, Falcon 20F taking off from Mazze airbase. 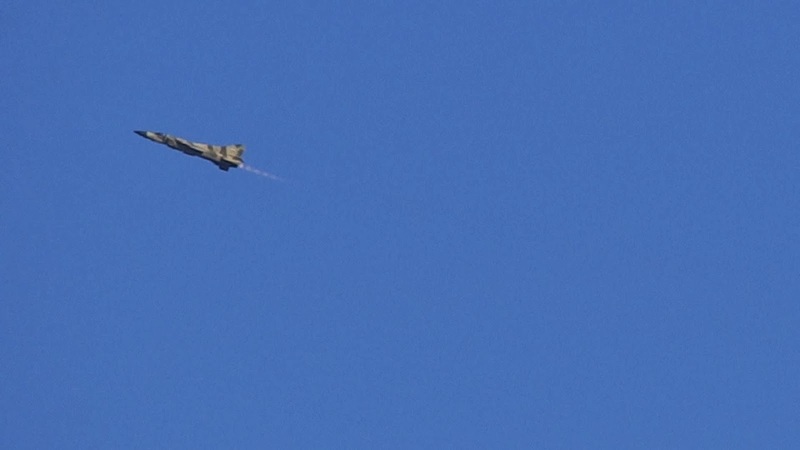 - After months of disappearance, the L-39 continued its sorties over Idleb (day flights) and over Aleppo city (mostly night flight), the remaining operational units are remained in Neyrab airbase (Aleppo IAP). 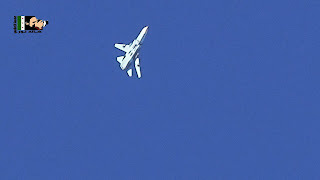 - The first appearance for a Syrian MiG-29 in action over Damascus. 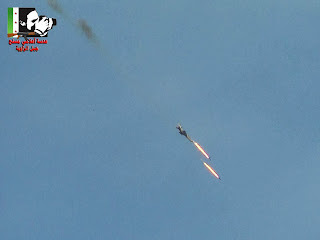 - The use of Iranian made 'Yasir' UAV, first spotted over Damascus. 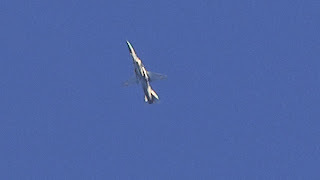 - Syrian MiG-23MF/ML first seen in action over Idleb. 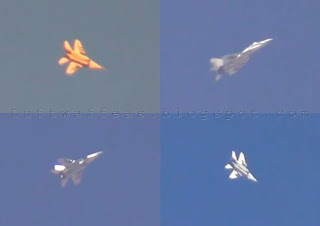 - The first clear video of Israeli F-15's over the Syrian/Lebanese borders. 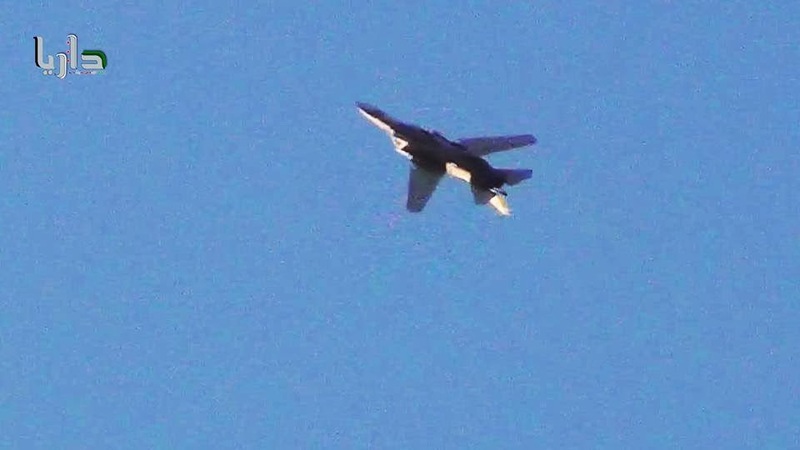 Spotting a Syrian MiG-23 over Jabal Azzawiyah area (Idleb province) is not new. The first appearance of this aircraft was recorded on 10th Aug. 2012 when a BN ground attack variant carried out a bombing sortie over Farkaya town, followed by another one of the same variant on the 24th of the same month. 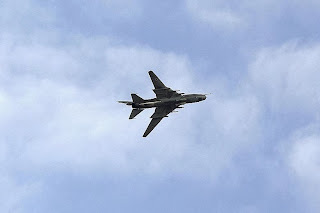 After that, the role of the BN was assigned mainly to the Su-24MK, with numerous records for the MiG-21's & Su-22's. 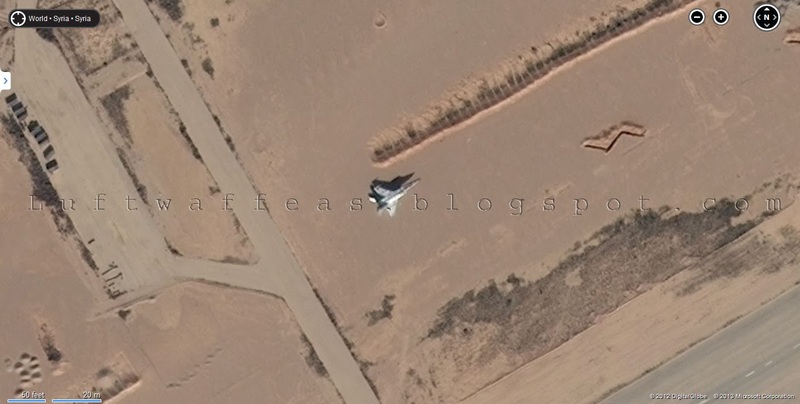 In September this year, and specifically on the 8th, the first MiG-23MF (fighter/interceptor) variant was spotted in that area. That time the aircraft flew in a straight line, armless and even without pylons. After that, and starting from November, such type continued flying and conducting ground attack raids over towns and villages in that area. 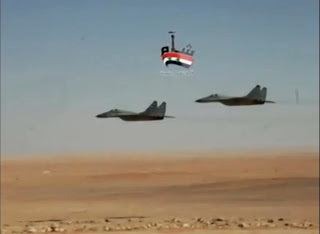 In the date above mentioned, an MF was photographed -above- maneuvering over the area fitted with Kh-23 air-to-surface guided missile under the wing-glove pylons and a Delta NM targetting pod is seen fitted to the air intake pylon. 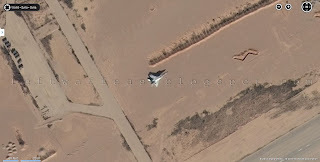 On 30th Nov., another MiG-23 was photographed, but this time it was the ML, the pure fighter variant!! It was fitted with B-8 pods launching S-8 unguided rockets over the area. 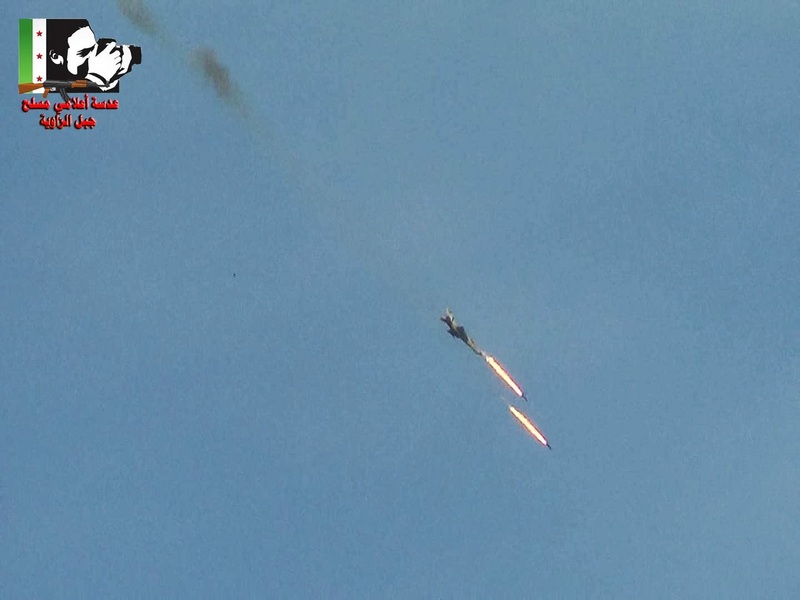 On 21st this month, an MF flew over Kafrunbel town and attacked a ground target with gun. In this photo above it can be seen climbing with afterburner after the attack. 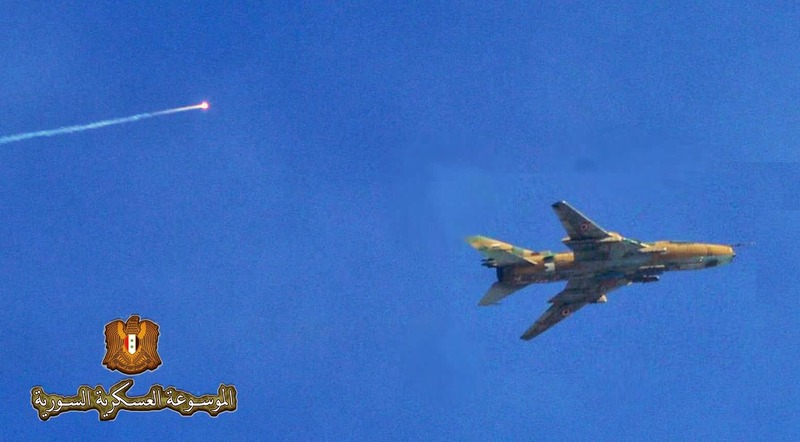 Two days later, on 23rd, another MF dropped two FAB's somewhere over the area, bringing to our mind that SyAAF is using any air-worthy airframe in its raids against rebels. This is not a new photo for Syrian MiG-23MF's trio; it was taken in 80s or 90s during the Air Force Academy graduation ceremony in Rasm Al Abboud airbase showing the Green radome this variant is famous with which means that the aircraft was overhauled and locally upgraded in 'The Factory' in Al Neyrab. One of the most artistic shot for a Syrian jet is this! 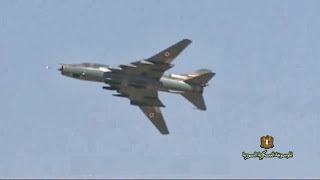 SyAAF MiG-21 with its landing gears down maneuvering to land in Hama airbase on 6 June 2013. 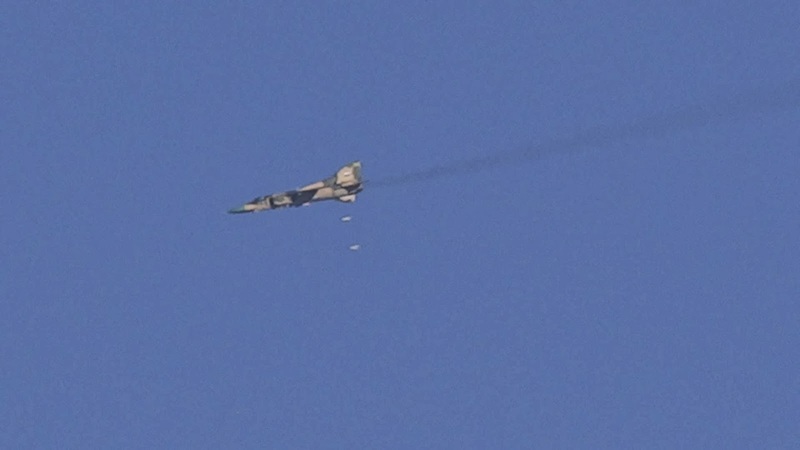 Another MiG-21 was spotted on 19 May 2013 also somewhere over the county of Idleb launching two S-24 unguided air-too-surface missiles. 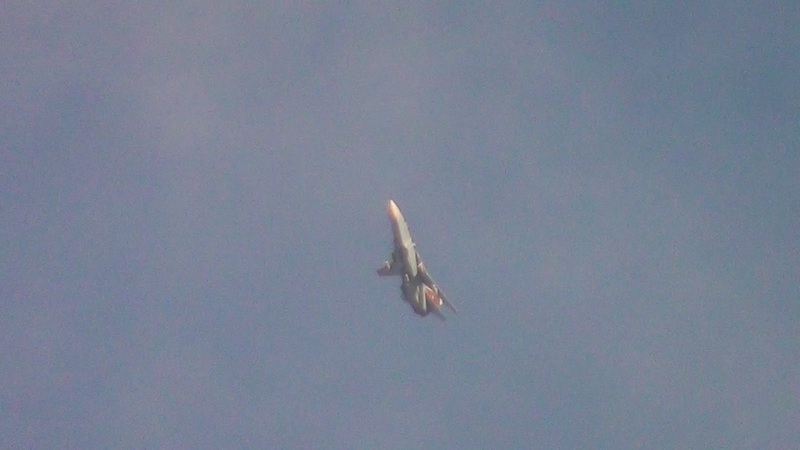 The glorious and the awesome MiG-29 in an amazing frontal shot inside a HAS but unarmed (should be in Seen AFB). Unfortunately, the pilot does not mounts the advanced helmet with HMS system 'Helmet Mounted Weapons Sight'...just a regular one. 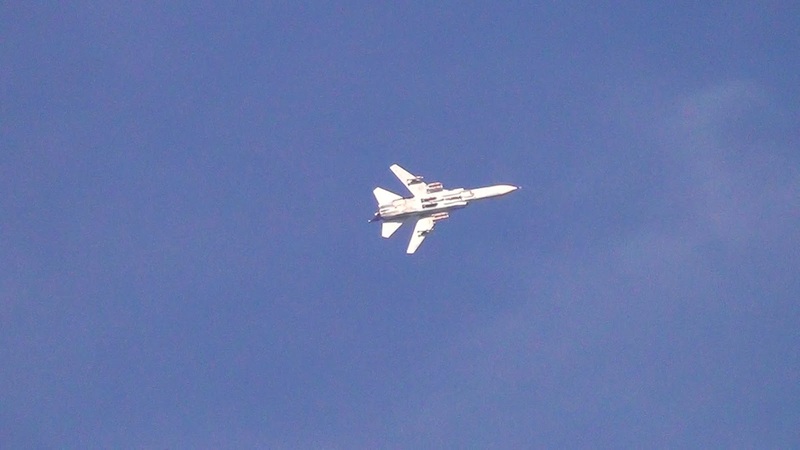 Another close up on the same MiG-29. 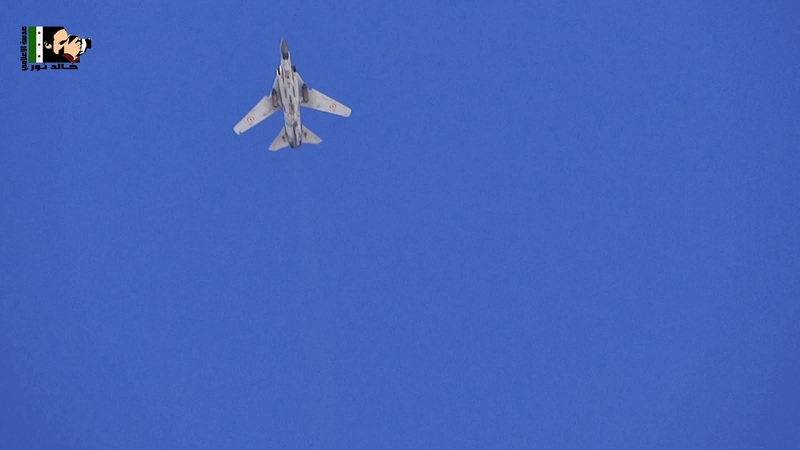 SyAAF MiG-23BN releasing FAB's over Yabroud on 9 Sep. 2013. 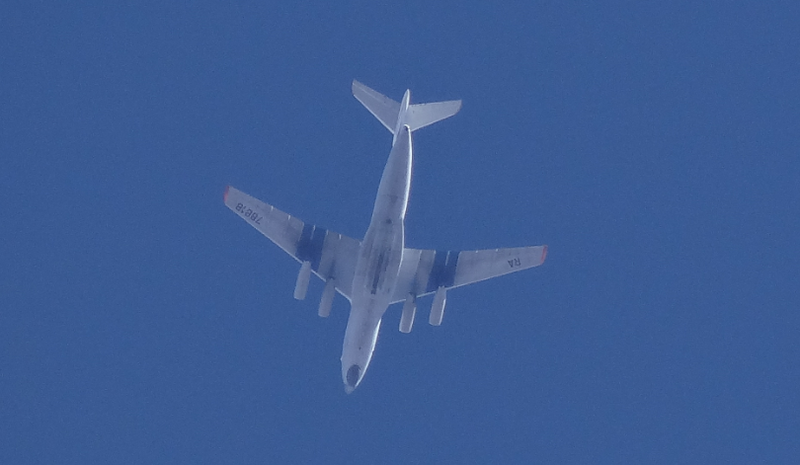 Very clear shot for a Syrian Air Il-76T with serial YK-ATD spotted while landing in Hama airbase on 25 Oct. 2013. 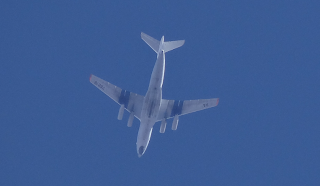 Just few days ago and specifically on 21 Dec. 2013, this Russian Air Force Il-76 carries the serial RA-78818 was spotted flying over Jabal Azzawiyah in Idleb province. Back!! to all fans, sorry for this gap as I was abroad for a couple of weeks. Anyway, I came back with a load of new and rare images will be posted here shortly! 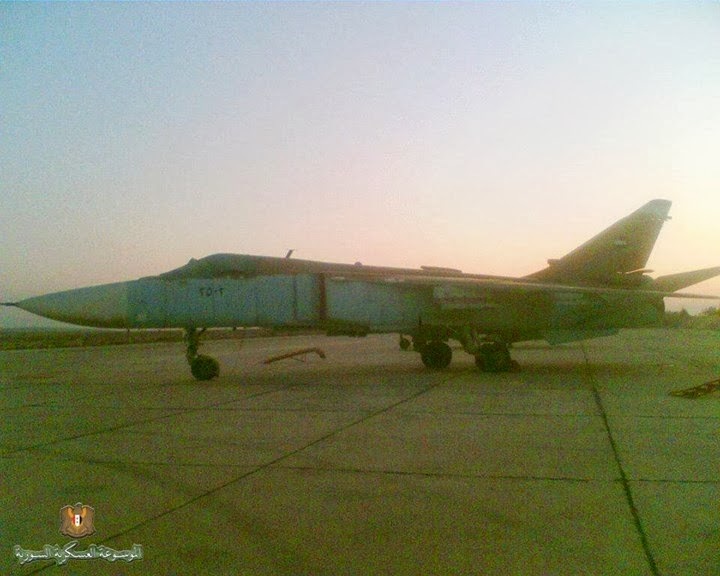 Starting posts of December from the point I stopped, as you all know it will be for the SyAAF Su-24MK. Very nice shot for a unit in flight, I am not sure when it was taken and where...was it during the live fire maneuvers? 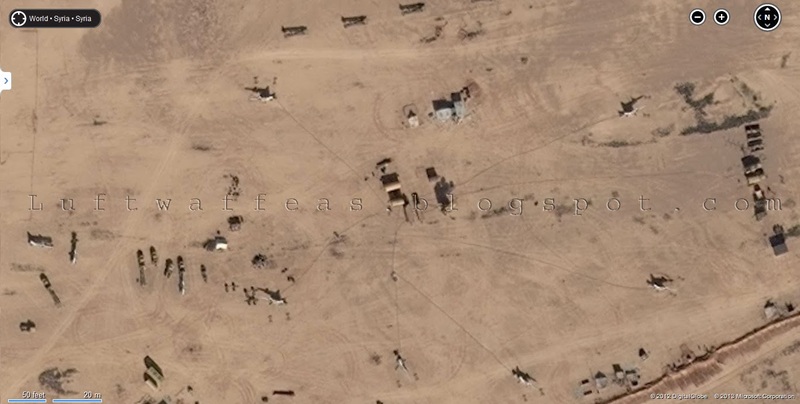 or been taken by a ground staff of some airbase (either T4 or Seen) ?!?! The airframe here carries the serial 2508, also all the pylons are fitted to the wings and fuselage. 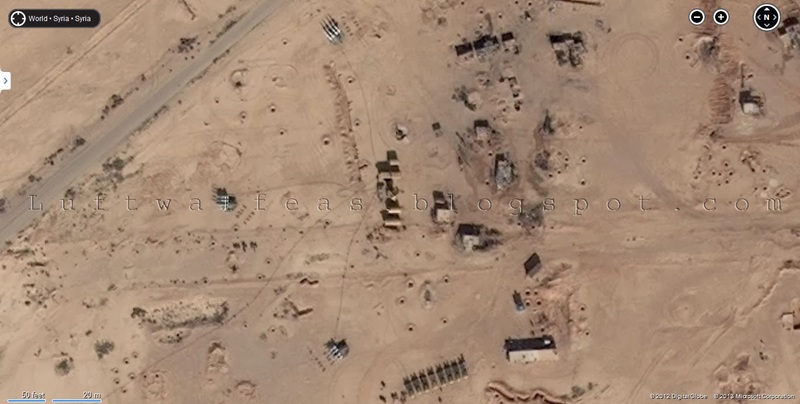 The second interesting photo is for another Syrian Su-24MK photographed in the T4 airbase on 16th Oct. 2013. The serial is readable here and it is 2514. The group here are called the 'Slavonic Corps' operating in Syria, for more info you should not miss reading Oryx's post about them HERE. Another airframe with serial 2502 was photographed on ground. It is just abnormal to see this aircraft stationed with 45 degrees oriented on tarmac, so this imagery might be taken near/at the back yard of a HAS. The famous Su-24MK videoed by a co-pilot on 15th Oct. 2011 passing over Aleppo city in their way to Rasm Al Abboud airbase (Kweres) in training just one day before the air personnel graduation ceremony held in that base. The serial of this aircraft could be read 2509. 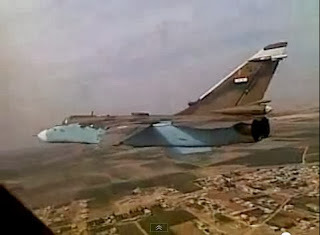 A shot for a Syrian Su-24MK just after taking off appeared in media in the state channel during the live fire maneuvers took place on July 2012. 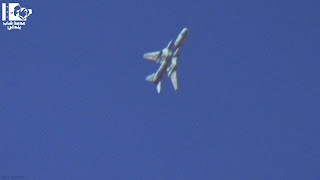 In action: the SyAAF relied a lot on this machine in ground attack sorties over Aleppo, Idelb, Homs and recently Dar'a with very few times seen over Eastern Ghouta in Damascus. 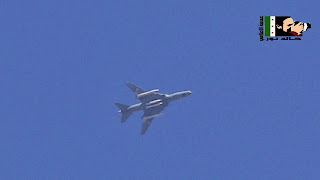 This one was spotted over the northern county of Aleppo (towns of Hayyan and Hreitan) loaded with Eight free fall bombs FAB's. It turned back after it carried out its attack sortie. 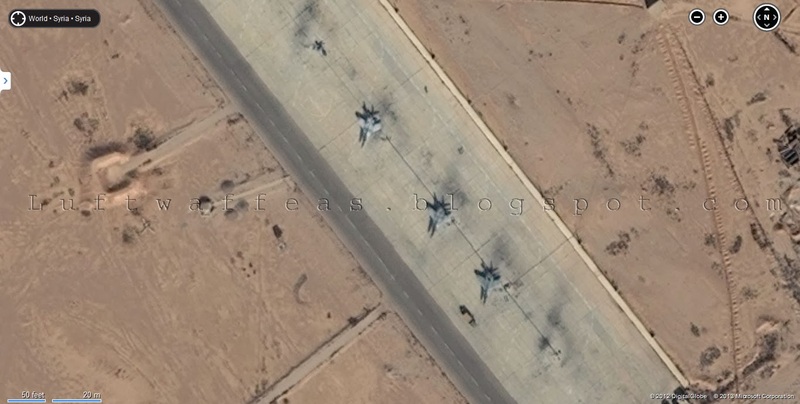 The fleet of Syrian Su-24MK's is based mainly in T4 AFB with some units in Seen AFB. Over Idelb and specifically over Jabal Azzawiyah area the Su-24MK's are flying almost daily like this one spotted there on 18 Sep. 2013. 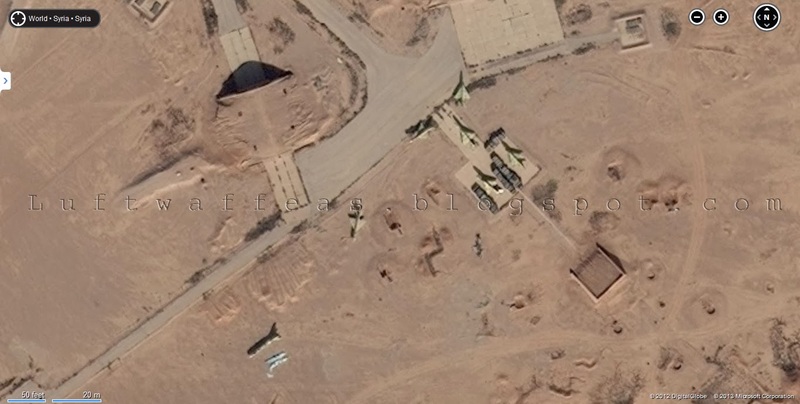 I would advise readers to have a look on Oryx's article about the same HERE with much details about the recent upgrade some of the SyAAF Su-24MK's have received. After the MiGs, we are moving to the Sukhoi family airframes those served and still serving with the SyAAF. 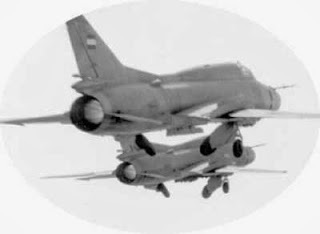 Although the SyAAF acquired the Su-7 and Su-20, but due to the lack of photos of these aircraft I would start posting some photos for the Su-22's. 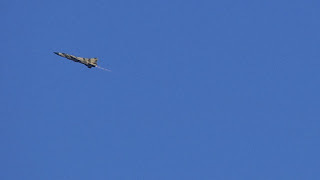 Above is a very rare shot of pair of Su-22M-3 been taken by Syrian military media while taking off. Another rare still but this time for a pair of the mighty Su-22M-4. This shot has appeared after the Syrian uprising. These M-4's look to wear the Dark Olive Green camo. Another SyAAF Su-22M-3 it carries the chaff/flares dispenser mounted on the top of the rear fuselage those are locally fitted to this aircraft (same as what we saw on the Syrian MiG-21bis and MiG-23ML's). I wouldn't say this is an M-4 variant since it lacks the rails for R-60 air-to-air missiles. 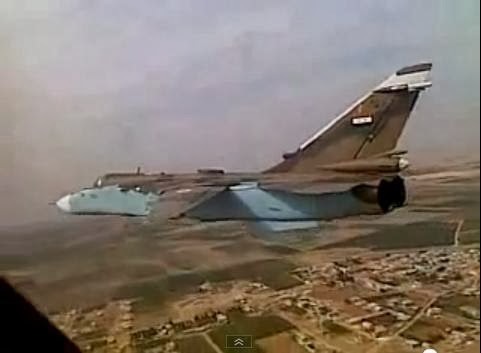 Clear shot for a SyAAF Su-22M-4. 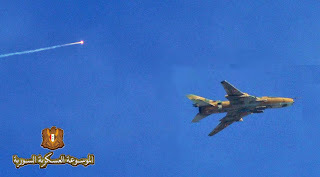 SyAAF Su-22M-4 fitted with two FAB's under belly seen in action during the uprising. 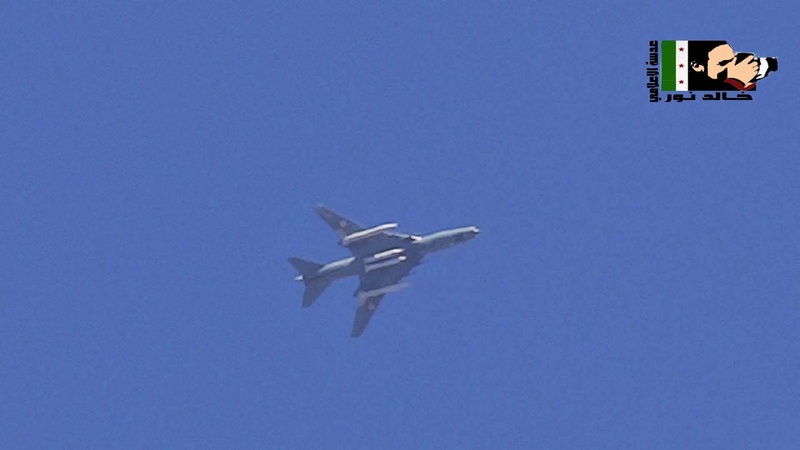 This Su-22M was seen maneuvering somewhere over Idleb, fitted with two fuel tanks under wings and two bombs under belly. 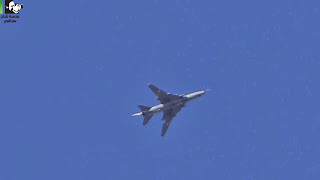 Similarly, a Su-22-M was spotted over Saraqeb (Idleb province) on 6th June 2013. 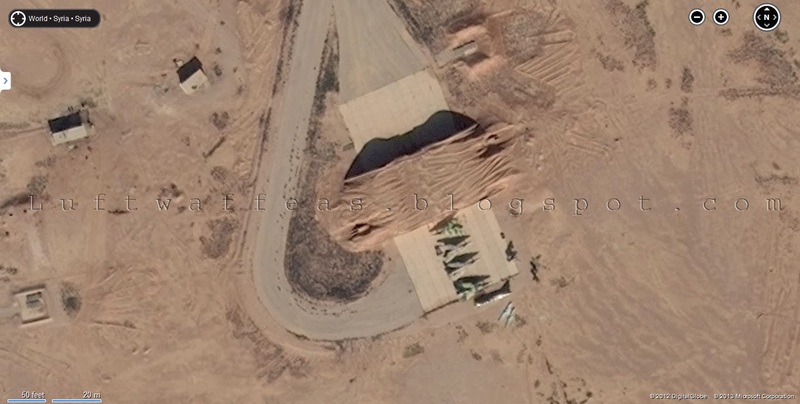 The SyAAF Su-22 fleet is distributed over T-4, Sh'eirat and Dhmeyr AFB's. 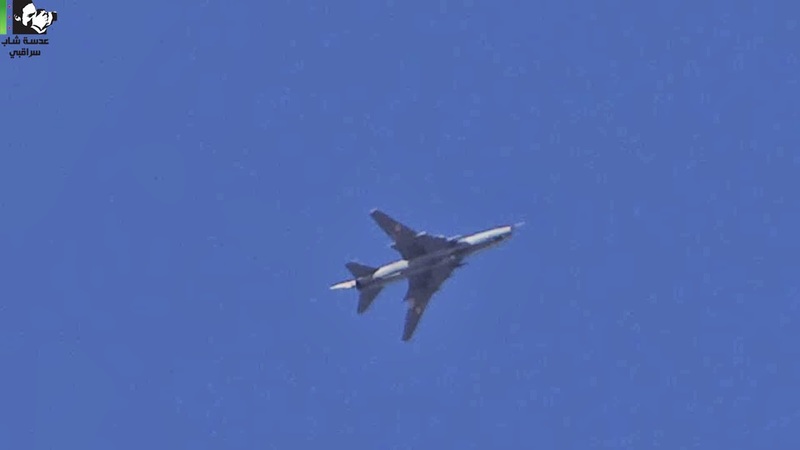 Over Damascus, a Su-22M-3, particularly over Yalda, and for the first time seen fitted with B-8 unguided rockets pods. 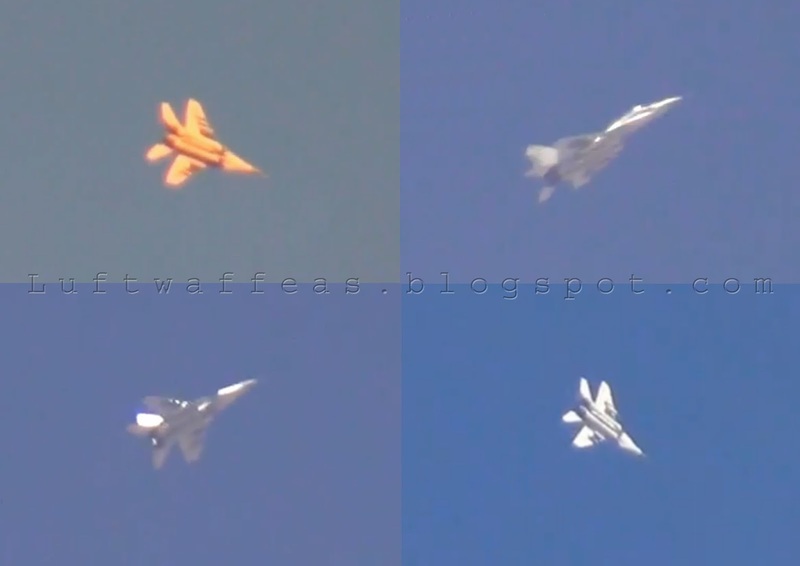 New update for the series of stills of the MiG aircraft family serving for the SyAAF. I would start here with a real treasure came to public this week: SyAAF MiG-29's!! 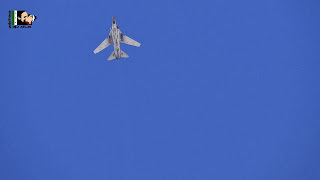 This photo shows a pair of Syrian MiG-29's just before seconds of taking off from their home base: SEEN AFB -note the other two MiG's inside the double shelter. Two things would make this photo Exceptional: If the serials were readable, and if air-to-air missiles were fitted to the pylons!! 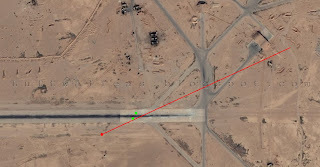 This is a key map for the SEEN AFB: the Red dot represents the location of the camera -targeting little to the right of the double HAS as shown-, white the Greed two dots represent the location of the MiG's on the runway preparing to take off. 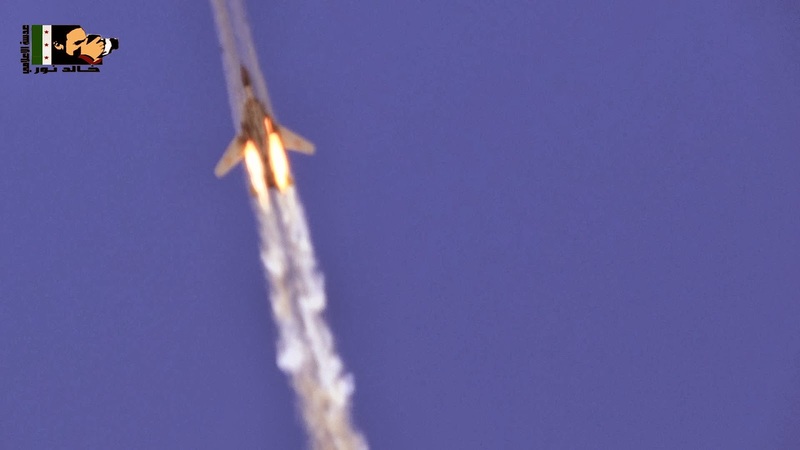 Another great still is for a SyAAF MiG-23ML with serial 2797 taking off (could be from Dmeyr or SEEN AFB). Two things to mention about this ML: Note the locally developed flare dispensers fitted on both sides of the tail fin, and: this is the same ML which was spotted in Krasnodar overhaul facility on June 2008!! (refer to this POST for further details). MiG-23BN spotted maneuvering over Darayya after an attack sortie on 15 Oct. 2013. 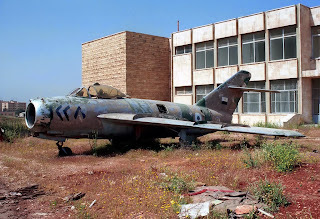 The very famous and the ever poorest SyAAF MiG-17 which was in display in the campus of the university of Aleppo photographed in 1996. The serial 1228 is painted roughly and could be written by the students themselves, but sounds plausible since a batch of SyAAF MiG-17's used to carry the serial 12XX. 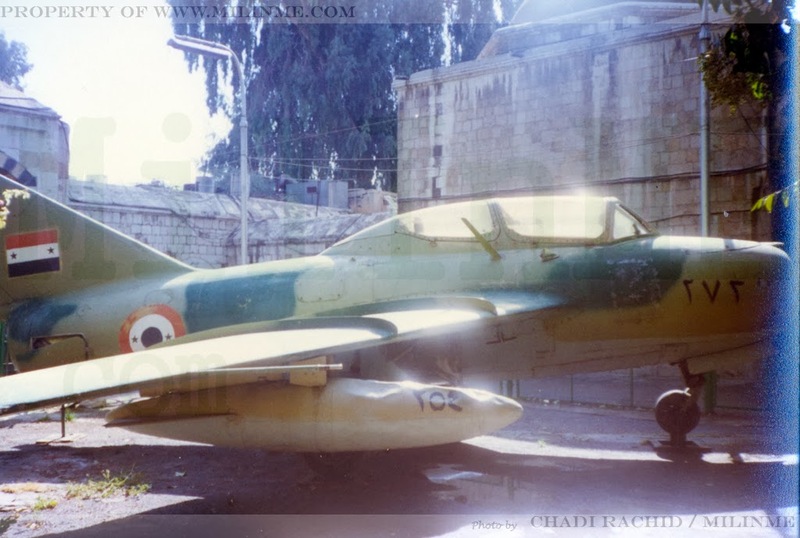 This MiG-17 was shifted somewhere out in 2001 or 2002. SyAAF MiG-15UTI photographed in the Military Museum of Damascus, carrying the serial 273. Note that the drop tank fitted under wing belongs to another airframe with serial 254. THE 'SEEN' AS NEVER SEEN BEFORE!! Yes, true, as never seen before!! 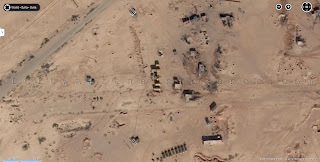 Again the SyAAF SEEN AFB is updated on the electronic maps, but this time BING did it, and did it perfectly!! 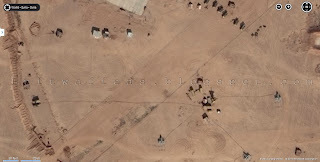 You can refer to the previous POST in order to get more info about this base and for better comparison about the novelties of aircraft and layout and the most important this is the SyAADF newly deployed in this base. View 1: Three MiG-29's on main tarmac. 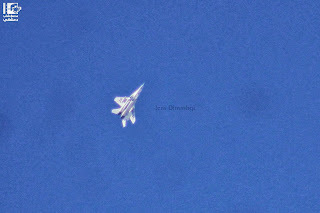 Note that the camo of the unit at the bottom looks almost plain, which confirms that there is not unified camo for all SyAAF MiG-29's. 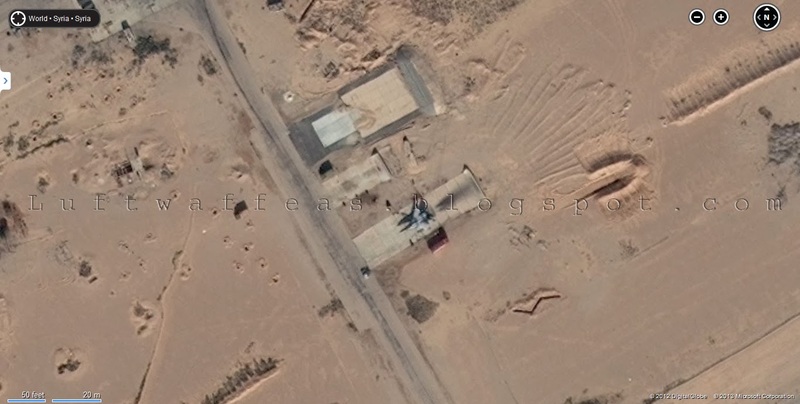 View 2: Another MiG-29 can be seen on the pad where maintenance team test engines after being overhauled. View 3: A new MiG-23 is added -first from the bottom- to the phased out units of this type. View 4: Six phased out MiG-21's. Note the scrapped wingless fuselage of a Su-7. 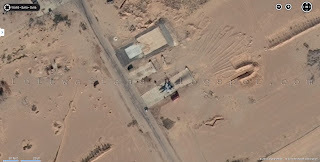 View 5: The MiG-25RB continues its rest in the same place after its accident some time in early 2000's. 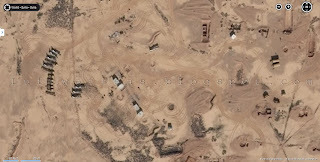 View 6: As mentioned above, these are the major novelties seen in this air base: the new SyAADF systems deployed here and there all around the airfield. 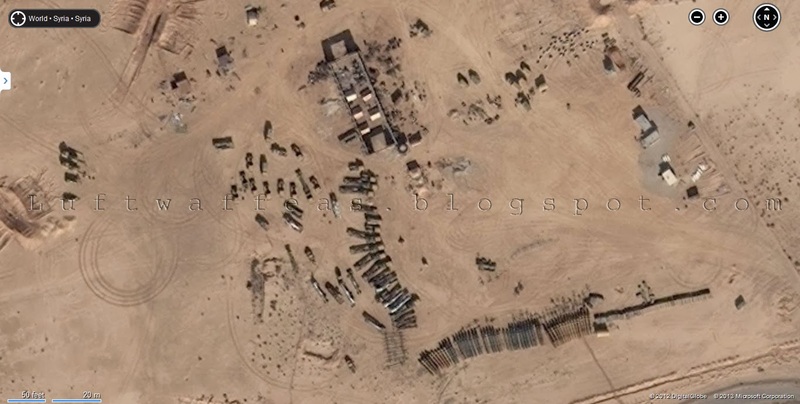 I'm not an expert with types of SAM's, I may tell that these trucks are supposed to be carrying SA-2 or even the S-200 missiles. I would prefer to leave it for experts to indicate the type of SAM system deployed in this spot. View 7: The trucks at the bottom which carries two missiles, look SA-3. 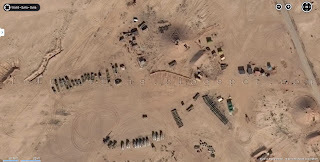 View 8: These are for sure launchers of SA-3. 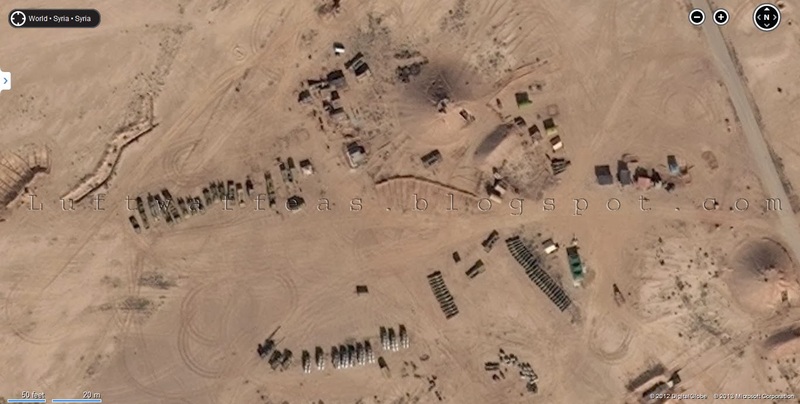 View 9: Another batch of trucks carrying SA-2. 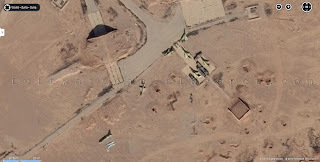 View 10: Launchers of SA-2. View 11: Launchers of SA-3. 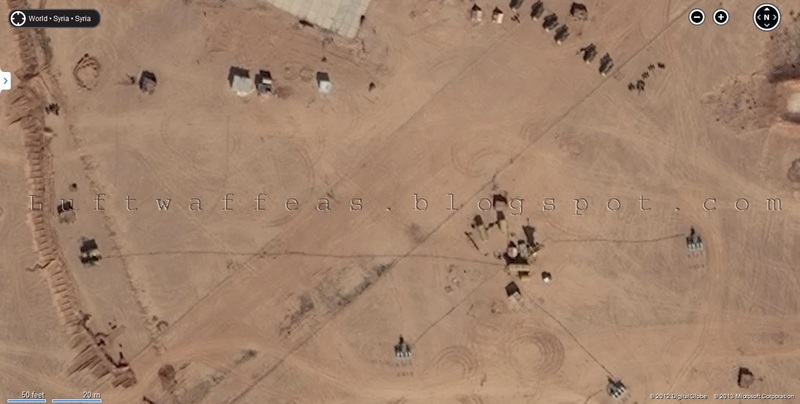 As I said, these systems are newly deployed around the base, as you can see clearly they were just laid in place even without ground preparations. After the MiG-15, 17, 21 and 23, you should guess that the next post -this one- should be about the MiG-29, especially in the absence of any new photo for the mighty MiG-25. Above is a recent great and very clear still of a SyAAF MiG-29 Fulcrum A with its dark and light gray camo, carries the reg. number 3433. 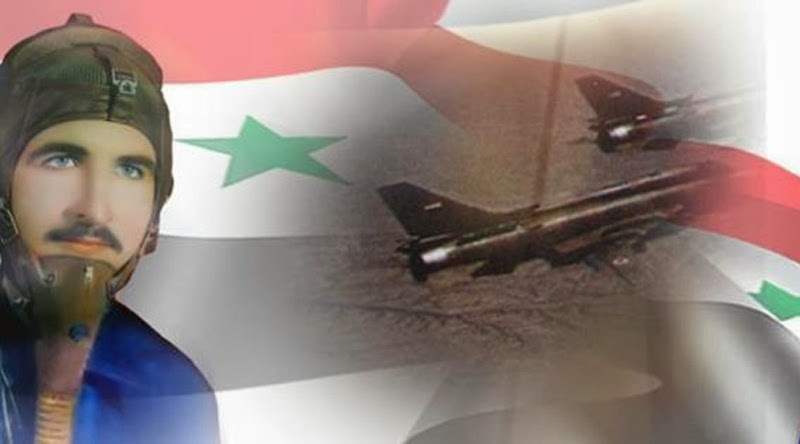 According to some sources, SyAAF received 48 units of MiG-29, others reduced the number to 36, while some, go further to minimize the number to 24 units only including the dual-seat training variant 'UB'. 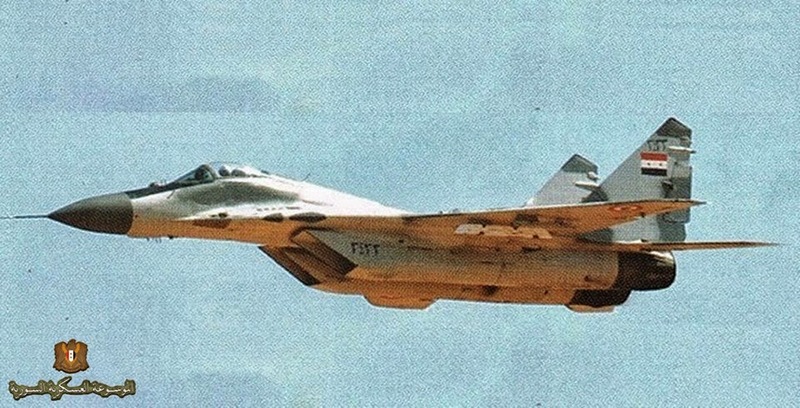 Above is an early photo for another MiG-29 with serial number 3436 or 3439. 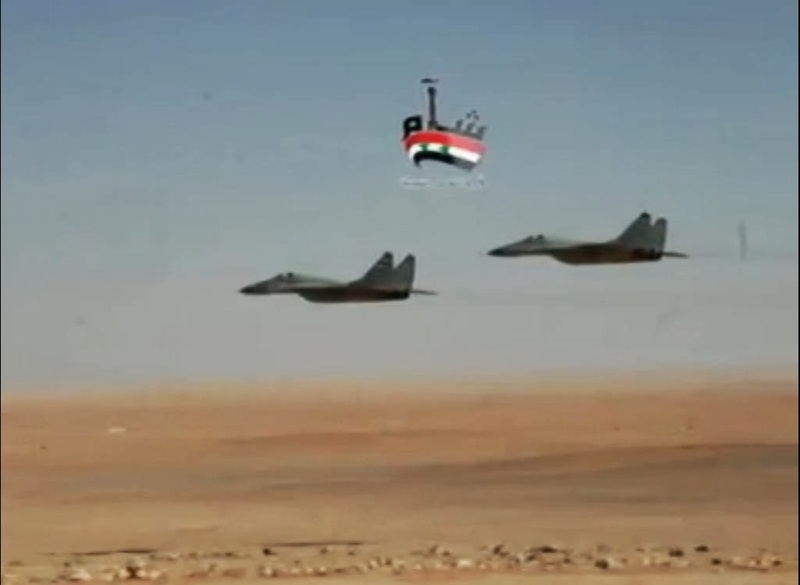 Pair of SyAAF MiG-29's flying as low as their shadow can be seen on the sands of the Syrian desert where they joined the live fire maneuvers took place on July 2012. 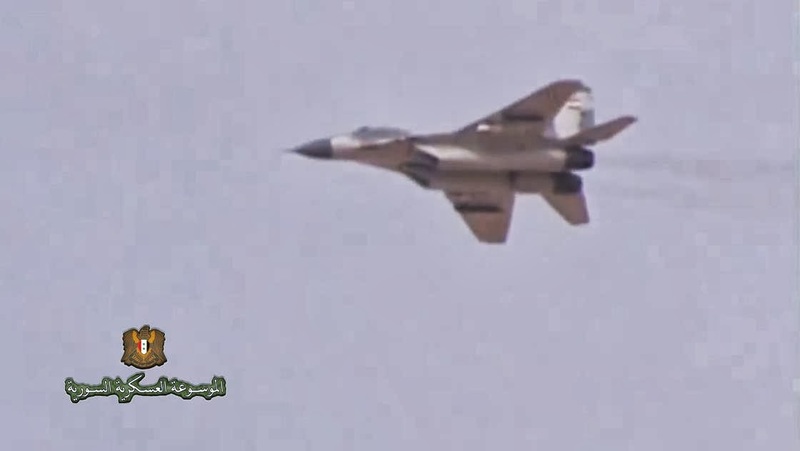 SyAAF operates the MiG-29 solely from the secretive Seen AFB. 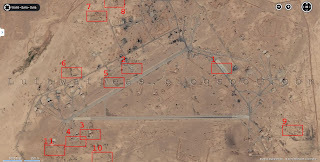 I have read in many reports that during the last 10 years, some units were deployed and operated from Hama AFB and some others from the T4 AFB, which is totally not correct. This take is also from the live fire maneuvers above mentioned. 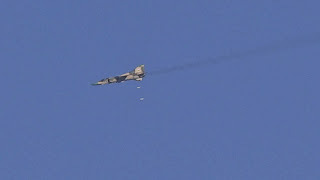 Today, the Syrian regime cared to choose this day, the first day of the Adha Eid festival, to start his attack and bombardment sorties over the civilian towns of Eastern Ghouta in Damascus using his MiG-29 units. Above is a SyAAF MiG-29 spotted over Eastern Ghouta fitted with S-8 unguided rocket pods (again thanks to Oryx for his post about this weapon of today). Using this type of advanced tactical fighters in such attack sorties, and with such an old fashioned weaponry gives a serious image about the exhausted fleet of SyAAF MiG-23BN's, Su-22's and even the Su-24MK's -those are quite busy with Idleb and Aleppo provinces. 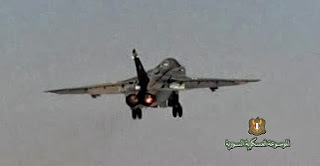 The question remains: why didn't SyAAF use their MiG-23ML and MLD instead of wearing these sensitive fighters which over the last six years received a serious maintenance in Neyrab's overhaul facility 'The Factory' to overcome the fuselage and wings cracks, in addition to fit them with advanced avionics which is said to be a partial package of the SMT's.